Ok... so I was a little optimistic that Harry Potter and the Half Blood Prince would bank over $100 million this weekend since it's $22 million midnight opener. However, despite my valiant predictions, Harry Potter still claimed the top spot with almost $80 million. In other news, it seems like everyone who wanted to see Bruno, saw it on opening weekend, as it dropped over 70% this weekend, slipping to fourth place. Well, the wait is over folks, as Harry Potter is back. 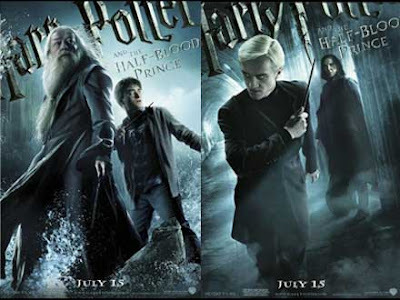 Half Blood Prince was pushed from last November's line up because The Dark Knight proved too much of a success last year for Warner Bros.
Why it might be a hit: Umm... if you haven't heard of the Harry Potter phenomenon over the past decade, you are lame. Besides, it already beat The Dark Knight's record midnight screening debut with about $22 million. Why it might tank: Fans getting old... Movie seems a little dark for tweenagers. Come on... being second to the last book, I'm sure this will do well.